During the Eurozone debt crisis, the amount of domestic public debt held by banks has contributed to the transmission of sovereign stress to the economy. As shown by the figure below, between 2008 and 2015 the median bank’s domestic sovereign exposure in stressed Euro-area countries grew from less than 2% to almost 8% of its assets, and over the same period its corporate lending fell from 28% to about 20% of its assets. This figure begs two questions: first, why precisely in distressed countries banks increased their domestic sovereign exposures? Second, did this increase in their exposures exacerbate the credit crunch in stressed countries? Median bank’s domestic sovereign exposure and loan-asset ratio in stressed euro-area countries (Cyprus, Greece, Ireland, Italy, Portugal, Slovenia, and Spain), 2008-15. The study by Altavilla, Pagano and Simonelli (2017) brings new evidence to bear on both questions, using monthly data on private sector lending and sovereign bond holdings for 226 unconsolidated Eurozone banks from 2007 to 2015, capturing – on average – 70% of the Euro-area banking system. As to the determinants of banks’ sovereign exposures, Altavilla et al. find that the increase in banks’ sovereign exposures in stressed countries is driven by government-owned banks, as well as to undercapitalized banks. Hence the evidence is consistent both with the “moral suasion” hypothesis and the “carry trade” hypothesis: the first holds that distressed governments lean on “their” banks to buy more sovereign bonds and thus reduce funding costs, while the second claims that banks with little capital tend to gamble for resurrection by investing on high-yield, high-risk sovereign bonds. The evidence also shows that the large liquidity injections made by the ECB in 2011 and 2012 reinforced the moral suasion channel, enabling public banks to buy more sovereign debt, but not the “carry trade” channel: at the time of these injections, stressed-country public banks increased their sovereign debt holdings by 17% more than private banks. The study also shows that banks’ sovereign exposures contributed to the credit crunch in stressed euro-area countries: the banks with larger sovereign exposures cut lending more deeply than less exposed banks when sovereign stress increased. This effect is transmitted across borders, as foreign subsidiaries of stressed country parent banks also reduce private sector lending in non-stressed host countries. Hence, the link between sovereign distress and private sector lending appears to be driven by supply and not demand-side effects. These findings are important for banking regulation: currently, euro-area prudential regulation gives strong preferential treatment to sovereign debt over bank loans, treating it as risk-free for purposes of capital charges and imposing no concentration limit on holdings. This creates an incentive for banks to invest in high-yield sovereign debt rather than extending loans to firms and households. The evidence by Altavilla et al. suggests that this incentive also strengthens the amplification of sovereign stress transmission to lending. 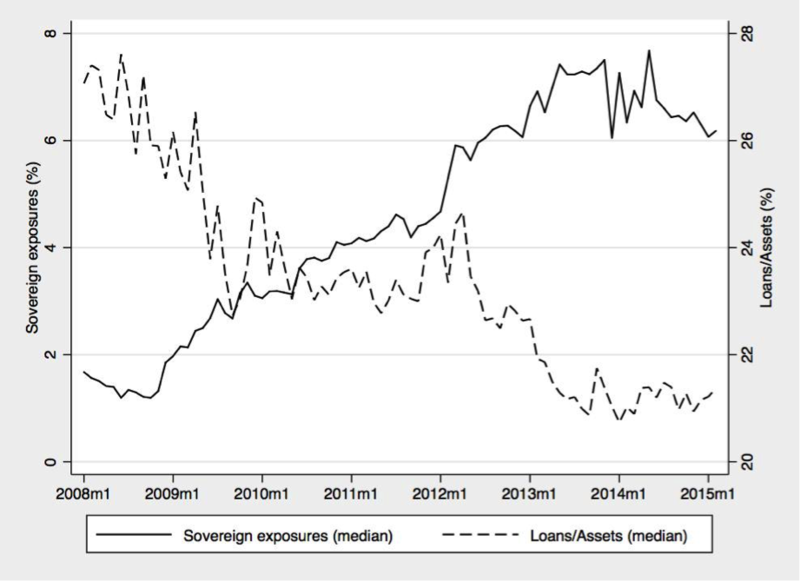 Currently, in formerly stressed countries, banks’ domestic sovereign exposures are larger than they were at the inception of the crisis, which raises the concern that a future resurgence of sovereign stress might trigger even larger effects on bank lending.